Spicy seared delicata squash, blackened onions, black beans, and pepper jack, tucked inside a tortilla and baked until melty and golden. Serve with a little pico de gallo or fresh tomato slices and dinner's made! I had a heinous parenting day yesterday. Usually I hide it, hide out, and/or just vent to the hubby, but this time, I took it to Facebook, complete with a Facebook-appointed emotion. ” – feeling exhausted.” I’m not a Facebook drama queen (although maybe I am – do the drama queens know they’re drama queens?) – so a day has to be pur-retty bad to be all status update worthy. But after the kid used my laptop like a trampoline, I’d had enough. I love my friends. Half a dozen other moms chimed in almost immediately, letting me know I’m not alone. And sometimes that’s all you need to know. So! 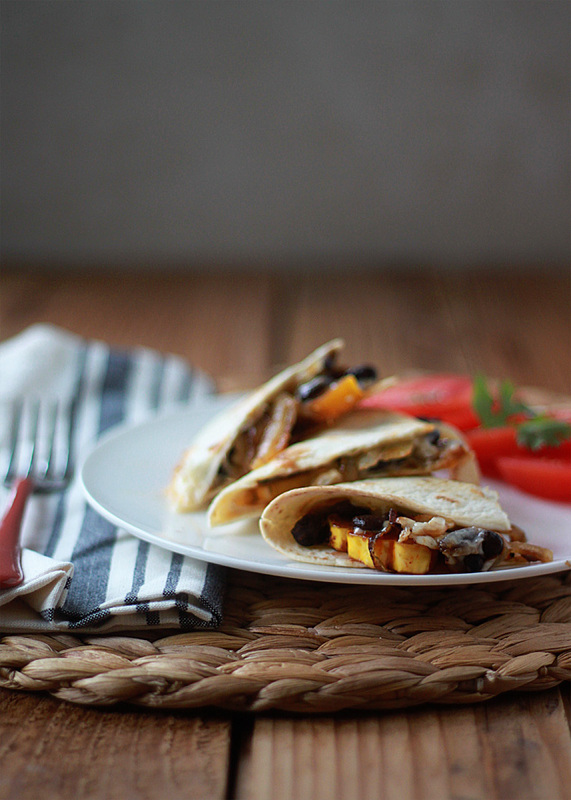 Smoky Delicata Squash & Black Bean Baked Quesadillas! They have nothing to do with my bad mom day, except that they were a definite bright spot. After I happened across a write-up for delicata squash that suggested that their mild flavor and tender flesh are perfect for soaking up the flavors around them, I decided to go for it and season the bejesus out of one for this recipe. Sorry, crooked little buddy! I basically gave the squash the taco meat treatment, except of course without the meat. And by that I mean that I sear the slices until they’re golden, then add some seasonings and water, give them a stir, and then let the water cook off. Just like taco meat! Except not! Highly seasoned delicata squash are delicious, I have found. I’ve roasted them for years, but this preparation is a definite winner, too. 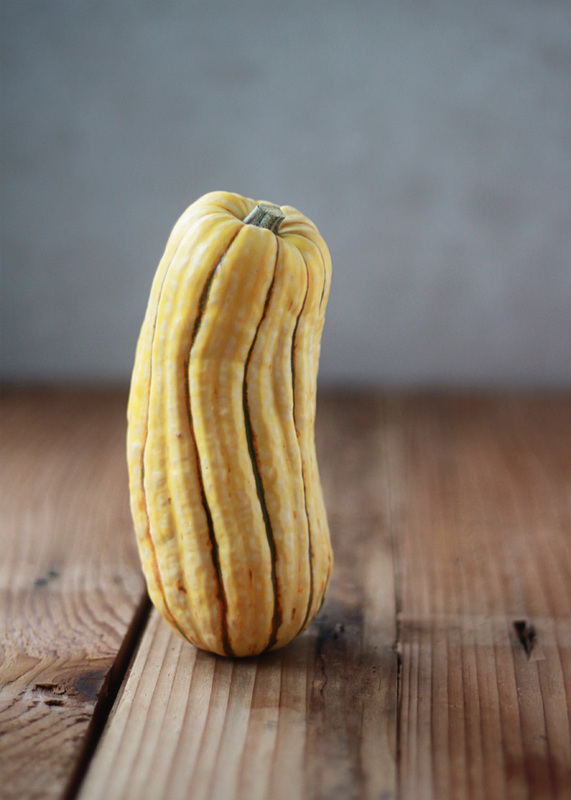 Another thing that’s nice about delicata – and, for me, cooking them this way – is that you really don’t need to remove the tender, edible peel. I’ve never been a big fan of the peel, but the lazy side of me insisted I try cooking them this way with the peel on. And they were great! The key is that they’re pretty thinly sliced, so I don’t find myself gnawing on a hunk o’ peel. Because no one wants a hunk o’ peel. Protein-rich black beans, seared onions, and pepper jack complete the picture. Fold ’em over and bake them for 20 minutes, and your bad parenting day is all but forgotten. Especially if you shut yourself in a room with them and blast Beth Orton music while chowing down. Who I suppose seems like a weird “bad day” choice but there is something about Beth that I just find strangely therapeutic. Beth and quesadillas. 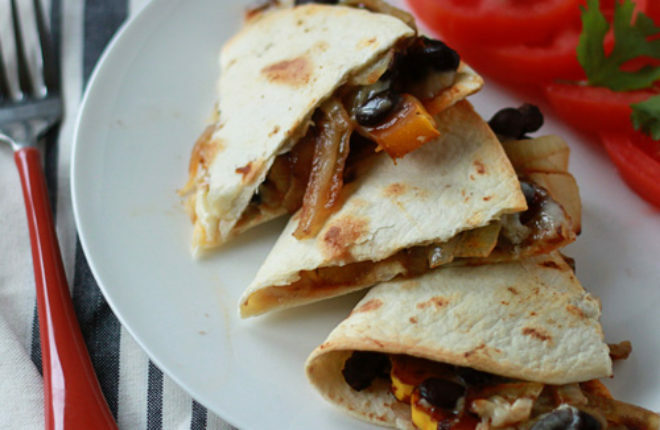 Place leftover quesadillas in an airtight zipper bag, label, and freeze. 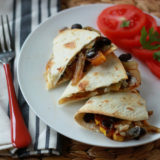 For a near-instant dinner, lunch, or snack, just place the frozen quesadilla on a baking sheet and bake at 350 degrees for 5-6 minutes, until heated through. Preheat oven to 375 degrees Fahrenheit. Set out two rimmed baking sheets. Drizzle 1 tablespoon olive oil into a large saute pan over medium-high heat. When hot, add the onions. Saute, stirring occasionally, until tender and browned here and there, about 5 minutes. Remove onions from pan and return pan to the burner. Reduce heat to medium and immediately add the remaining 1 tablespoon olive oil and the squash. Cook, stirring occasionally, until most of the squash pieces have been seared golden brown on at least one side and are beginning to soften, about 5 minutes. Reduce heat to medium-low and add water, brown sugar, cumin, smoked paprika, chili powder, salt, and pepper. Stir gently to distribute water and spices and continue to saute, stirring occasionally, until the water cooks off, about 3 minutes. Remove from heat. Place a flour tortilla on your prep surface and add 1/6 of the toppings to the bottom half of the tortilla, in a single layer. Start with the squash, then scatter about 3 tablespoons of black beans, then add some onions and finally 3-4 slices of the pepper jack cheese. Fold the tortilla over to form a half-moon shape and carefully transfer to a baking sheet. Repeat with remaining tortillas. Make sure the quesadillas sit in a single layer on the baking sheets - I fit three to a sheet. Note: you can brush the quesadillas with a little olive oil at this point to help them bake up a little more crisp and golden. I usually do this, but I forgot this time and I really didn't miss the extra oil, so I left it out of the recipe. Bake until the cheese has melted and the tortilla is golden brown and crisp in spots. 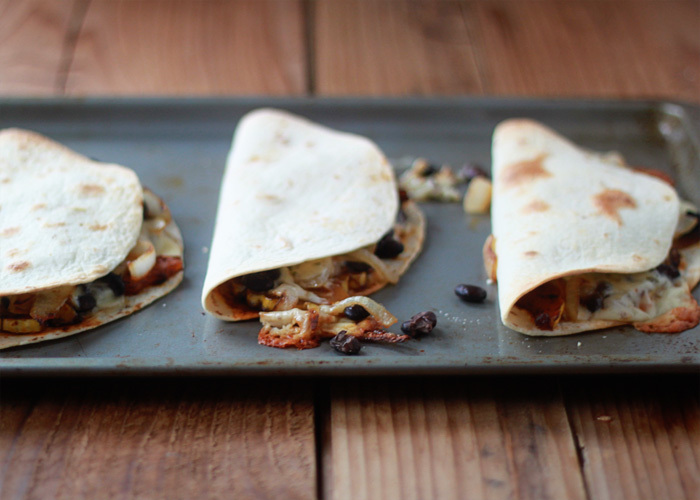 Using a pizza cutter, cut each quesadilla into thirds. Transfer to plates and serve with assorted toppings, if desired. 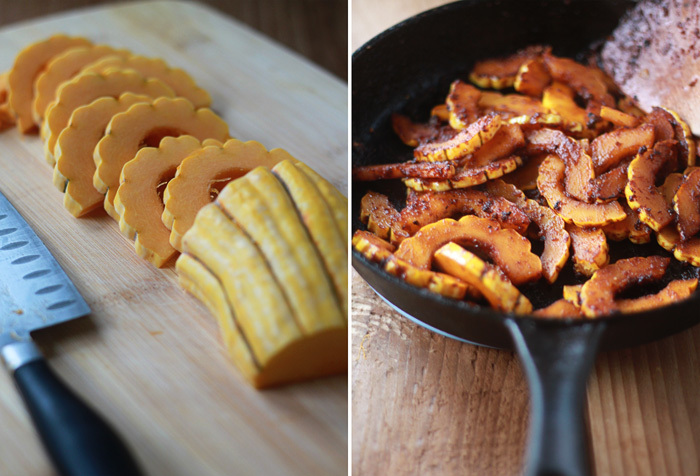 These look absolutely amazing, and I love swapping out meat for delicata squash! Adding these to next week’s dinner line up! This looks so good! I love the idea of a nice golden crust on the squash! Bet it’s yummy! Sounds like it’s time for a bit of vacation… alone! I hope things have calmed down a bit for you. This recipe is mouthwatering! 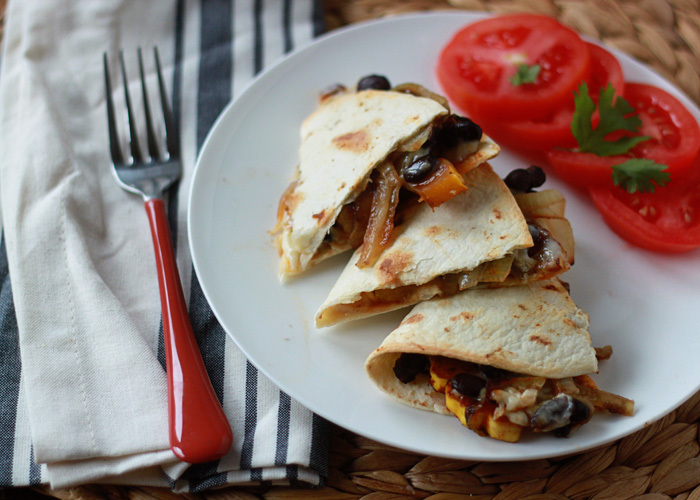 The delicata paired with the black beans and spices is a wonderful combination… and packed in a quesadilla!? I’ll take it! In season, smoky, spicy and packed full of goodness! Thank you for your delicious recipe, Kare! A vacation sounds like heaaaaaaven. Somewhere with waving palm trees and cabana service. I’m totally dreaming right now. 🙂 Thanks, Traci! That looks wonderful, but I’ve never heard of a Delicata squash, nor seen one sold anywhere, and I’ve lived in 10 different states over the past 48 years of marriage. Where do you live? I’d be inclined to not look for solace on Facebook (I don’t partake) but cook the goose of any kid who pretended my laptop was a trampoline. That will give you far more satisfaction. Been there, done that with all three. They lived, and thrived, and grew up and left. Don’t send him to Grandma’s, either. I have a brand new Delicata tablet, LOL! Sorry, I couldn’t resist a little tongue in cheek. Don’tcha hate when you go to flip it and half the fillings slip out? Bad things good people, man! 🙂 Thanks, Rachel! Some days Facebook is the one who understands, and who lends a willing ear to your rants when you don’t want to burden your friends and family. And that is okay. Thanks Mr Zuckerburg. I love that squash replaces the meat here, and gets the same easy treatment. We were planning on having quesadillas in our house soon, and I think this will be the veggie option on the table. Also, baked in the oven is so much easier than making a mess of the fry pan. These look super seasoned and super delicious! Thank you Amy! The parenting week overall is on the upswing, but it has been a bit of a tough one overall. Monday was by far the worst though! 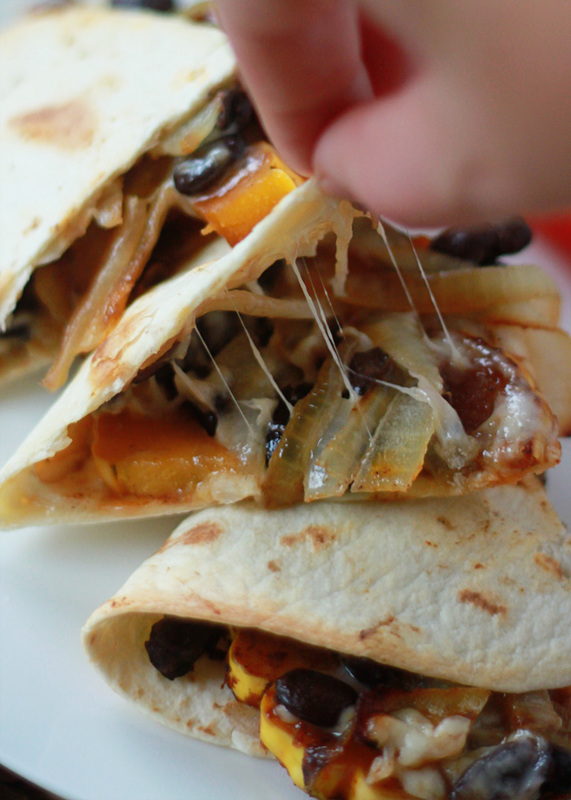 Yes – baking quesadillas is *awesome*! No one-at-a-time business; they cook all together at the same time and it’s all hands-off! Sometimes it just needs to be done! And then you get what my friend calls the “french fry feeling” – the feeling you get after eating too many french fries. Regret. 😉 This time wasn’t too bad though. Thank you Gwen! Read this at work yesterday so I stopped at Yakima Fruit stand on my way home as I knew they would have the delicata squash. I was not disappointed. I Have the squash mixture warming in the skillet now as I’m waiting on my husband to get home so I can assemble and pop the quesadilla’s in the oven. After letting the squash and spice mixture cook a couple of minutes I added the drained black beans to the mixture. I just sampled it and it has a great flavor. I plan on taking the leftovers to work with leftover lime cilantro rice for a yummy lunch. I’ve never seen quesadillas done in the oven before either and so this will be a new test for me. Thanks for another great recipe. I made this tonight and it was delicious! Didn’t have any of the special squash it called for, but yellow squash I had tasted really good. I will be adding this to my dinner rotations. Thanks for sharing! This recipe is one of our autumn/winter staples in our home! I look forward to delicate squash showing up in our markets each year because this is a meal everyone (preschooler included) adores. We freeze the leftovers as well. Thank you so much!